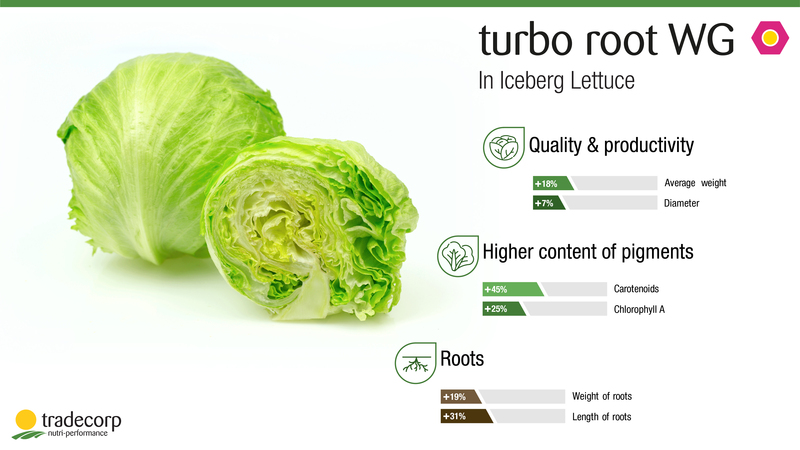 Studies carried out by Tradecorp in various Iceberg Lettuce orchards within the region of Murcia (Spain), confirm that the use of biostimulants and soil activators, such as Turbo Root WG, strongly increase the nutritional values acquired by the crop. The antioxidant activity of the foliar tissues increases almost three times fold, and these tissues have a lower nitrate content. This is an added value for final consumers. This increase in nutrition values occurs thanks to the positive effect that the biostimulant provides to the cultivation soil which helps the plant develop a greater concentration of these substances. The results have also shown that there was an improvement in the Iceberg Lettuce crop’s quality and productivity. 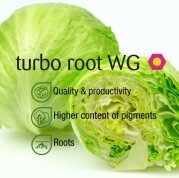 The periodical application of Turbo Root WG increases the average weight of the lettuce by 18% and its diameter by 7%. Researchers also discovered that the plant’s roots weigh more and were longer. In the first case, the increase was 19% and in the case of the length it was 31%. The use of biostimulants also allowed the lettuce to have a higher content of pigments, of up to 45% more carotenoids and 25% more chlorophyll A. The effect of Turbo Root WG on these parameters has resulted in a lower post-harvest-damage rate and, therefore, in a greater use of lettuce pieces.